Not getting the results you expect? These tips might help you out! 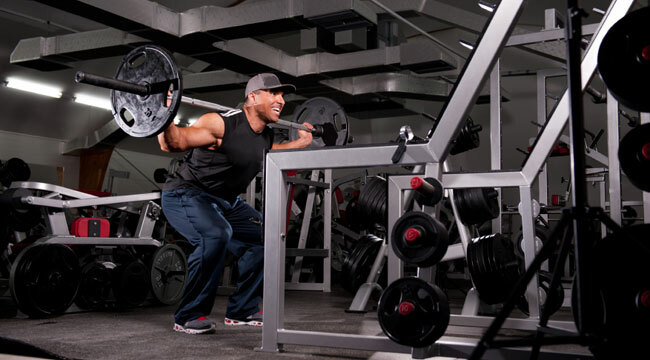 Your best bet for maximizing strength is to use free-weight exercises over machines. But if overloading your muscles for hypertrophy is what you’re after, give Hammer Strength machines a closer look. Scientists at Western Kentucky University (Bowling Green) found that subjects’ one-rep maxes were significantly greater on the Hammer Strength machines compared to free weights. This suggests machines are better for days when you want to use as much weight as possible. But experts warn against using Hammer Strength as a marker for how much you can lift: Just because you can bench-press 400 pounds on the machine doesn’t mean you can bench that much with free weights. The squat is the king of all leg exercises. Typically we recommend using a shoulder-width stance to target all four quadriceps muscles, as well as the hams and glutes. But with squats, the width of your stance alters the focus placed on certain muscles such as the vastus medialis (teardrop muscle on the inner quads), vastus lateralis (outer quads) or glutes. 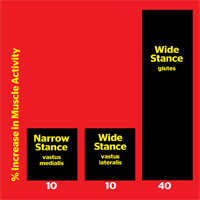 This graph shows the percent increase in muscle activity of these muscles. Tip-Off : To focus on building more outer thigh sweep or building up your glutes, go with the double shoulder-width stance. To build up the teardrop muscle, choose a hip-width stance. If your upper pecs are lagging and you’re benching away on the standard 45-degreeincline bench, try dropping it to 15–30 degrees. Research suggests that moves performed at 45 degrees place too much stress on the shoulders to adequately overload the upper pecs.